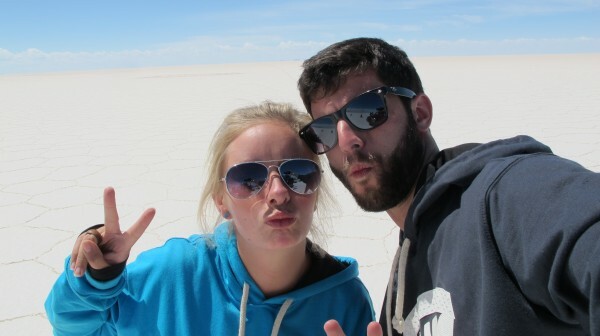 In the Salar de Uyuni. After a bit of rest from our circuitous route through southern Bolivia, we awoke in the bright and clean Valle Hermoso Hostel in Tupiza. In the shadows of the early morning light, Tupiza had only hinted at its beautiful scenery. By noon, the multi-hued mountains stood majestically in stark contrast to the bright blue, desert sky. Tupiza cannot be described without using such stereotypical imagery as one imagines from the “Wild West.” In fact, I will save both myself and the reader time, and just tell you to picture a quiet, desert town in the Wild West, not the real Wild West, but the one concocted by Hollywood, and you will have a spot-on image in your head of this town. While we did spend a few days enjoying the views of this bucolic town, we were there to go on a tour of the Salar de Uyuni, the world’s largest salt flat. The four-day tour would take us in jeeps all over the unpaved desert. Christine and I were joined by 10 other travelers, a driver for each of the three SUVs, and two cooks. Our fellow travelers came from far and wide, with a total of nine different nationalities. I was the only American. Our fellow travelers were as diverse as they were fun to be around. We shared our jeep with a Swiss brother and sister who were traveling together for a year. In addition to their native Swiss German, they also spoke English and fluent Spanish. Our driver did not speak a word of English, so it was helpful to have our own translator. Though we could not readily communicate with the driver, his navigational abilities were borderline superhuman. We would drive down a single dirt road for hours, and without help from GPS or a sign he would make a turn onto another dirt road and keep going. If he had blinked, he would have missed the turn off, but he just kept on chewing his cocoa leaves and driving as if it were no big deal. The desert just outside of Tupiza. 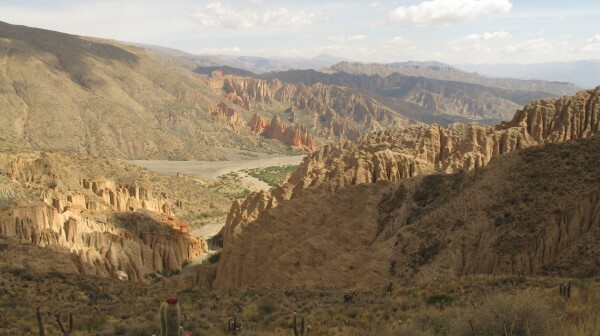 The first day, uneventful aside from the breathtaking landscape, ended in a small Bolivian village situated at an equally breathtaking 4200 meters. Since it was the first day and all the guys wanted to show off, we seemed to think it was a good idea to play soccer. Within five minutes, the altitude had effectively sapped our energy, and we were gasping for air on the sideline. Well, most of us were, our Swiss friend was calmly smoking a cigarette. Sleeping proved a problem for many of us, including Christine and me. My heart raced and my breathing was shallow. At a certain point, I gave up on rest and went out into the cold pre-dawn air. Although I had not intended to pull an all-nighter, I was able to enjoy the best star gazing I had ever experienced. The same thin air that was causing my body fits, was also responsible for allowing more starlight to reach my eyes. Many of constellations were different in the southern hemisphere, but not all. Orion was still clearly visible, Jupiter shone brightly over head, and the Milky Way stretched magnificently across the sky. The second day included much of the same scenery, only this time with more outcrops of rock. Matt, an Austrian traveler, took it upon himself to try to climb ever single rock at every single stop. Usually, we had to honk the horn, and yell at him to return to the car, but that would not dissuade him from doing more of the same on our next stop. Throughout the day we saw an abundance of llamas and other domesticated animals, but midway through the afternoon we came across a flock of flamingos in a shallow pond. As we walked up to the shore, the pale pink birds retreated, never giving us as good of a view as we would like. Christine and our travel companions hanging out on some ancient coral. By the third day, the scenery was basically the same: vast deserts, rocky outcrops, mountains, occasional volcanoes, and endless paved roads. This is not to say that the views were not spectacular, they were. Our first stop was at Laguna Negra, the black lake. The lake itself was nothing to write home (or blog) about, but it was full of birds happily chirping away. In the distance was an active volcano with the faintest puff of smoke rising from its far side. From there we drove to a section of desert that had been a coral reef a scant few million years ago. The rocks still maintained their distinctive coral shape (and sharpness). 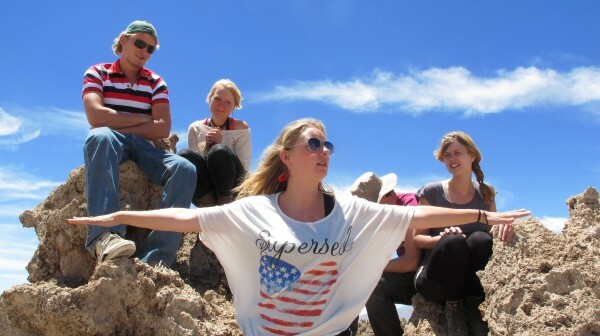 We stopped and had lunch between the ancient coral, and then it was on to the main attraction: the Salar. If our driver’s navigational ability was impressive in the desert, it was even more so out on the Salar. The flat can quickly become disorienting; its endless series of blinding white hexagonal tiles stretch out as far as the eye can see. The Salar was perfectly level, and seemed to go on forever. It was an alien landscape, one that did not seem to belong on this planet. When science fiction writers describe alien worlds, they tend to make them uniform, say, a desert world, or an ice world, or one surrounded by only dense jungle. But our world is so diverse, why are the fictional ones so boring? We stopped at Isla Incahuasi, an “island” in the middle of the salt flat that has more or less become an enormous tourist trap. The island charged admission for entry (that wasn’t included in the price of the tour), and, having already been burned by one tourist trap that day, we took one look at the cactus-covered hill, and decided as a group to not pay, and to create our own walking tour. We spent about an hour walking around the island. The salt crunched underfoot in a very satisfying way, much like snow and ice in winter. Of course, there was no confusing the surroundings for winter, as the hot sun beat down on our backs. The scene reminded me of the Kurt Vonnegut novel, Cat’s Cradle, wherein the world freezes over from a science experiment gone horribly wrong. Totally real. Christine will be missed. We ended the day with pictures and watching the sunset over the flat. 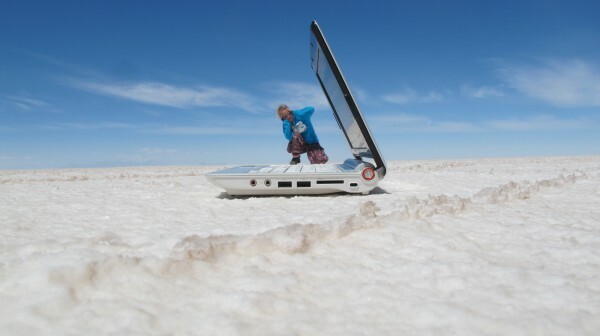 The Salar creates some interesting perspectives for the camera, so it has become a big deal to take trick photos there. Well, if there’s a trick to trick photos, we were not getting it. Most of our attempts ended in disappointment, but we did get lucky with a few. The final day of the tour got off to an early start. We had to take a jeep halfway up a volcano to watch the sunrise, before going on a short hike to the top. The sunrise was particularly dramatic. We watched and waited in the cold and dark desert air for the first rays of sunlight. It rose slowly behind a mountain in the distance, only increasing our wait. Just before the first ray cleared the mountain, we felt the temperature increase a fraction of a degree, and then, a moment later, there it was in full force. Sol. The sun. The life-bearing nuclear furnace that we take for granted nearly every day. The hike was not that long, and should not have been particularly strenuous, but without breakfast or proper atmospheric pressure, we found ourselves gasping for air more than we should care to admit. 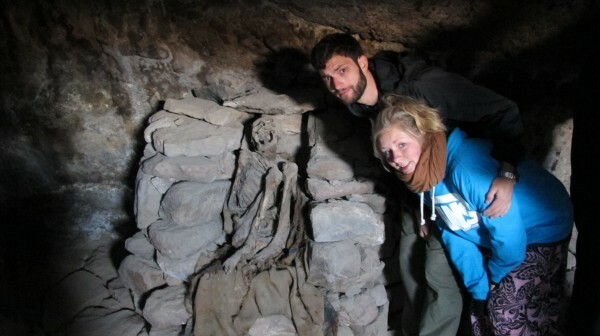 We spent a few moments at the peak, and then it was back down the mountain to see some Incan mummies. We finally got our breakfast after the mummies, because eating was at the forefront of my mind after hanging around dead people for an hour, and then it was back to the salt flat. We took more pictures, though our enthusiasm for the second batch did not match the first. The early morning after four full days on the road had taken their toll, and many of us were ready to be finished with the tour. Our final stop was just outside of our destination city of Uyuni. It was a graveyard for old trains. Some of the trains had been converted into very creepy playground equipment, including several swings and seesaws. It was an interesting place, but it was also our shortest stop of the tour. By this point, we were done. 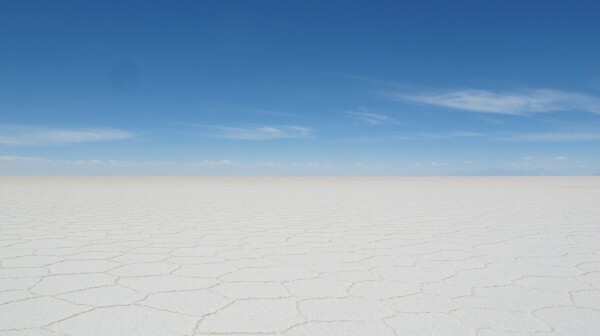 The arrival into Uyuni, a city which travel guides can’t even recommend in good faith, was perfectly timed, with a bus departing within a half an hour. We said some quick goodbyes to our friends who were not taking the bus, and then hit the road once more. We were off to La Paz to continue our Bolivian adventure.